Or, click once on the web object placeholder, and use the Options tab on the Storyline ribbon. How do you want your web content to display? Choose either Display in slide or Display in a new browser window. When do you want your web content to display? 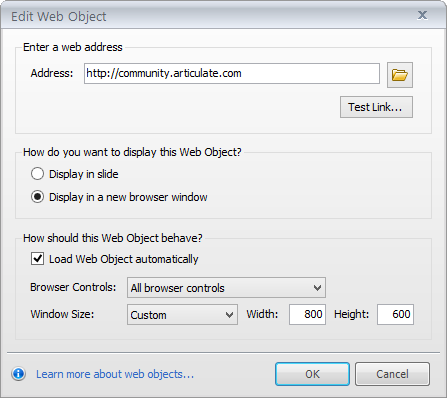 Mark the Load Web Object Automatically box if you want your web content to load without any interaction from learners. Or, uncheck the box if you want your web content to load only when learners click it. Tip: When Load Web Object Automatically isn't marked, it can be helpful to give your web object placeholder a meaningful image, so your learners will know what it's for. To do so, right-click the web object placeholder, and select Change Picture. Then browse to the image you want to use, and click Open. If you change your mind about the image you added, right-click it, and select Reset Picture. Use the Browser Controls drop-down to specify which controls the new window will have. Use the Window Size drop-down to select a size for the new window. If you select Custom as the window size, Width and Height fields will appear, allowing you to specify the exact size in pixels. Reminder: If your web content is located on the Internet or an intranet, learners will need permission to access it when they're viewing your published course. Otherwise, the web object will not work. Preview: Click the Preview button to view the selected web content. It'll display in the placeholder on the slide itself. Click the Preview button again to stop the preview. 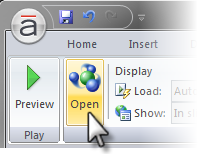 Open: This button launches the web object in your default browser. Load: When do you want your web object to launch? Choose Automatically if you want it to load without any interaction from learners. Or, choose When clicked if you don't want your web content to load until learners click it. Tip: If you wait to load your web content until learners click it, you might consider giving your web object placeholder a meaningful image, so learners will know what it's for. To do so, right-click the web object placeholder, and select Change Picture. Then browse to the image you want to use, and click Open. If you change your mind about the image you added, right-click it, and select Reset Picture. Show: How do you want your web content to display? Choose either In slide or In new browser window. Size your web object placeholder on the slide using the Height and Width fields. Enter the pixel measurements, or use the arrows to adjust the values. 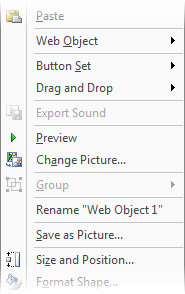 Preview: Select this option if you want to preview your web object on the slide. (You can also double-click on the web object placeholder to preview it.) Click anywhere outside of the web object to end the preview. Change Picture: If you want to specify a placeholder image for your web object, select Change Picture, and then browse to the image you want to use. This is especially useful if you've configured your web object to load only when clicked. The image you select will be visible to users until they click it to load the web content. If you change your mind and want to remove an image that you applied to a web object placeholder, right-click the placeholder again, and select Reset Picture. Rename: This option allows you to change the default name (Web Object 1, Web Object 2, etc) assigned to web objects in Storyline. Another way to rename web objects and other items is to use the timeline. Size and Position: This is another way to specify an exact size and position for your web object placeholder. To learn more about the Size and Position dialog, take a look at this tutorial.